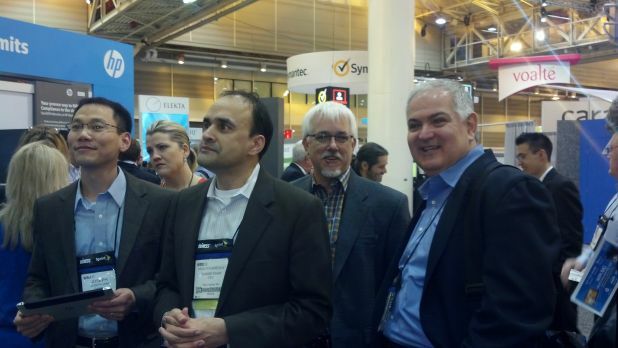 I want to thank everyone who participated in our HP Healthcare mobility tweetup today here at HIMSS. We had a great discussion and heard how different organizations are using mobile devices in the clinical setting to improve patient care. Also, we had the special privilege to hear from several people from Pediatric Associates, greater Seattle, WA. They were the recipients of the Greenway Innovation Awards at the Annual PrimeLEADER User Conference. With over 80 providers at seven locations, Pediatric Associates leverages the Greenway platform to eliminate multi-location challenges, improve billing performance and support patient empowerment and engagement. With the availability of Windows 8 devices in the health care setting, we will be seeing a rise in the use of mobile devices among physicians and nurses. Windows 8 slate tablets are allowing clinicians to run fully functional enterprise-level applications on a light, thin, touch-based tablet and they can dock these devices and maintain a full level of productivity by using a large monitor, keyboard, and mouse. Have you given Windows 8 for a spin? Here at HIMSS, you can hold and test a wide variety of Windows 8 mobile devices ranging from slate tablets, convertible tablet PCs, and laptops.